Decorating your home in a way that seamlessly combines style and functionality can be challenging. Regardless of how expensive the furniture or decor, sometimes our homes still seem to be missing “it” and fall short of the perfect rooms we see on HGTV. One solution is hiring a professional home stager or redesigner to help rearrange your existing decor in a way that has more impact, making your home feel fresher and more modern. But if you’re not quite ready to have a professional come in, use these easy tips to add decorator style on your own. Declutter. Many of live with too much “stuff.” When you have a lot of “stuff,” you have more to clean, more to organize…in short, you create more work for yourself. Having less clutter also helps re-direct the focus in the room to the things you truly love and/or use. Whether you choose to donate, sell, or haul it to the trash, SIMPLIFY your surroundings. Add life. As any one of my clients can testify, I am a BIG believer in the power of plants in the home, both for staging and redesign. Plants and other organic elements — twigs, shells, natural wreaths, even really convincing faux plants — add character and warmth to a room and create an emotional connection for home buyers and home owners alike. Color has more impact when it’s used sparingly and not competing against other colors for attention. 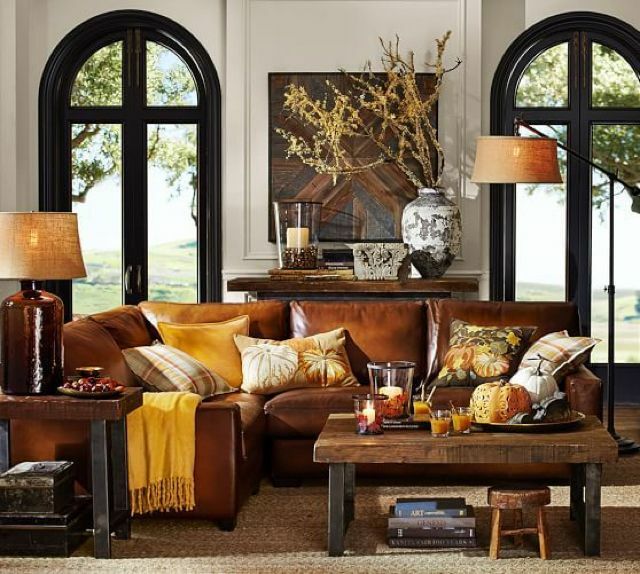 While it may sound boring, using shades of gray, white, or beige on the more permanent elements of your home, like sofas and walls, generally offers a lot more flexibility when it comes to decorating. Plus, it’s simpler and more cost effective to add color with throw pillows, art, and other decor…and swap out those touches of color for something else when your tastes change. Do you still need a little help getting your home “just right?” Contact the professionals at Three Bears Home Staging & Redesign in Katy, TX and we can help! Paint color sets the tone for your home. The right color brings everything together in harmony. The wrong color can feel overwhelming and chaotic. 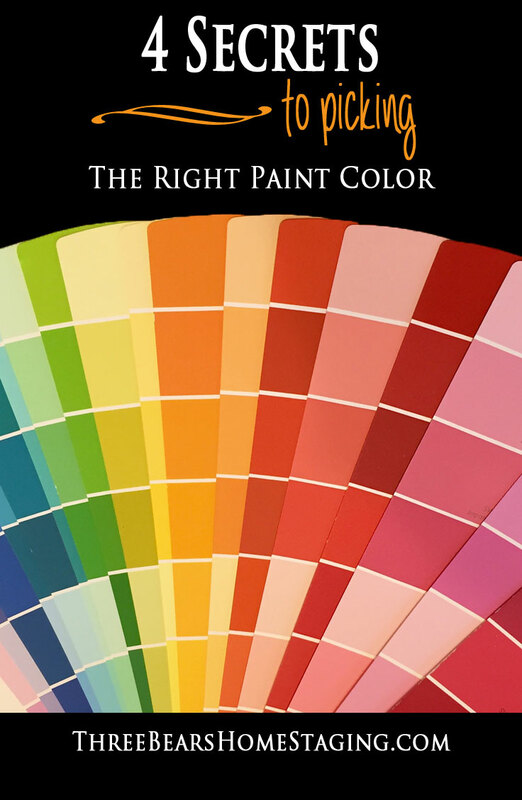 You can avoid an expensive decorating mistake by using these tricks of the trade to pick the paint color that’s right for you. Know how light will affect the feel of the space. Evaluate how the light in YOUR space will affect the color. In other words, do NOT choose paint based solely on a color you selected at the paint store/online or because it worked in another house or even in another room! Natural daylight will reflect the truest hues. Southern light is warmer and brighter, while Northern light is cooler and dimmer. Incandescent lighting will bring out the warmer, yellower tones in color. Fluorescent bulbs, though energy-efficient, cast a diffuse, shadowless light that gives a blue tinge to the colors in the room. Warm wall colors (yellow, gold, orange, wheat tones) lose their warmth in older-style fluorescent light. We recommend using LED bulbs between 3000K and 3500K (usually labeled “Warm White” or “Bright White”) where possible to see the truest paint color (to learn why, see our blog post on choosing the right light bulb). Consider the flow between other rooms. Color should bring the space together with a natural flow. This is especially true in open floor plans, which are typically better suited to one main color throughout the home with some well-placed accent colors in a few places. Hint: One safe and effective way to add some dimension is to select tints or shades from the same color strip. Try a sample. Once you’ve narrowed it down, purchase a sample from your favorite paint store and paint a few large pieces of poster board. Hang your paint samples on different walls for a few days and note how the light changes and how it plays with your other accessories. *I provide free 8″ x 10″ color samples to my color consultation clients. Still need a little help? Three Bears Home Staging offers affordable color consultations that can help you choose the paint that’s right for you! 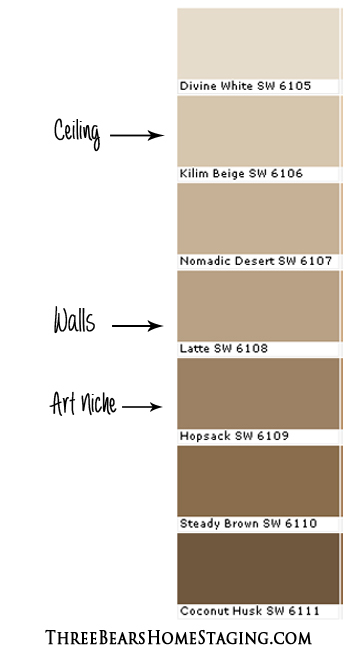 We also have great color palettes that work for home staging! 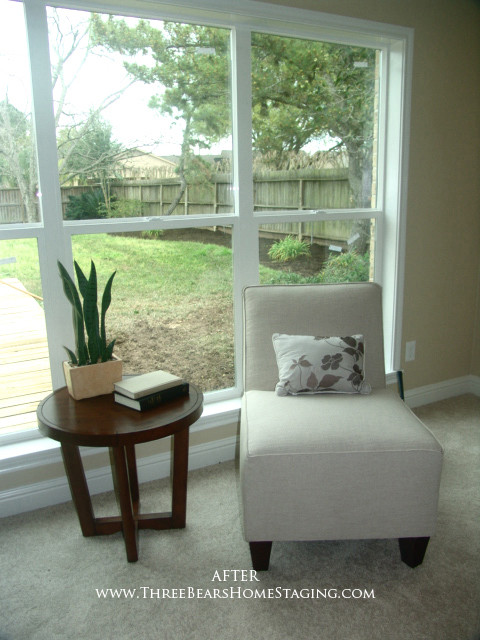 Call us at (832) 377-0785 to transform your home into a color palette you love! 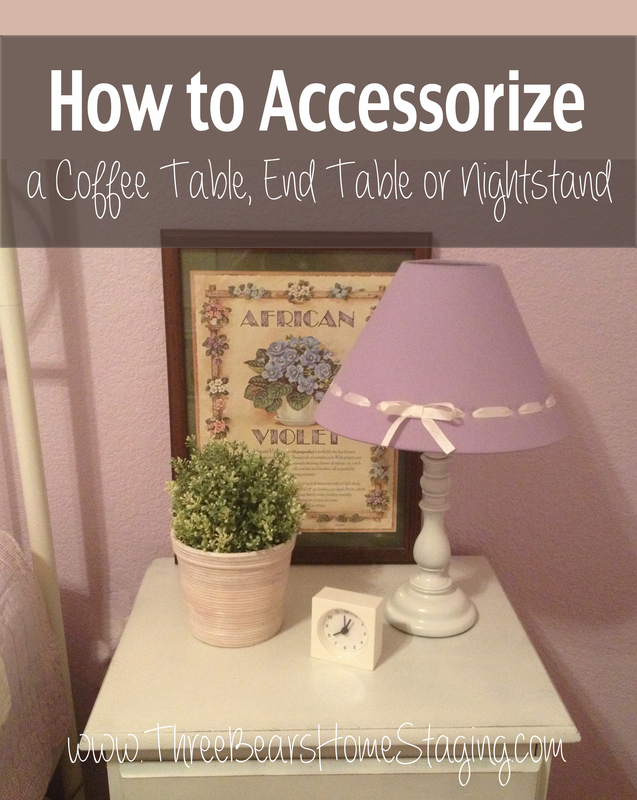 Not sure how to accessorize an end table or nightstand? Stuck on how to style a coffee table? The possibilities are endless, and there are no hard and fast rules, but the goal is to always keep basic design principles in mind while using accessories as tools to express the homeowner’s style (redesign) or to freshen up and neutralize the room (staging). Use groupings in odd numbers (three to five pieces is ideal). Vary the heights of items used (small, medium, and large) to keep the eye moving. A popular staging trick is using a small stack of books to add extra height to an accessory! Incorporate organic elements (plants, branches, sea shells, flowers, wooden bowls) to bring the outside in. Layer your accessories. It’s okay to let a lamp cover a portion of the artwork or to layer art elements. For staging, choose neutral accessories that update any setting without showcasing a hobby or profiling the owner (while your home is on the market is NOT the time to display your collection of sports memorabilia or unicorn figurines). For redesign, however, it’s all about the homeowner and surrounding them with the things they love (NOW you can bring out that collection); use unique items that add character, such as something purchased from a trip, and group around it. Don’t place accessories in a straight line, crowd the space with too much or place items in a way that blocks conversation. Each item should add interest and complement the entire arrangement. When the eye has too many things to focus on, nothing stands out and the brain interprets this as cluttered and crowded. Remember that less is more because it allows the viewer to truly appreciate and examine what is on display.